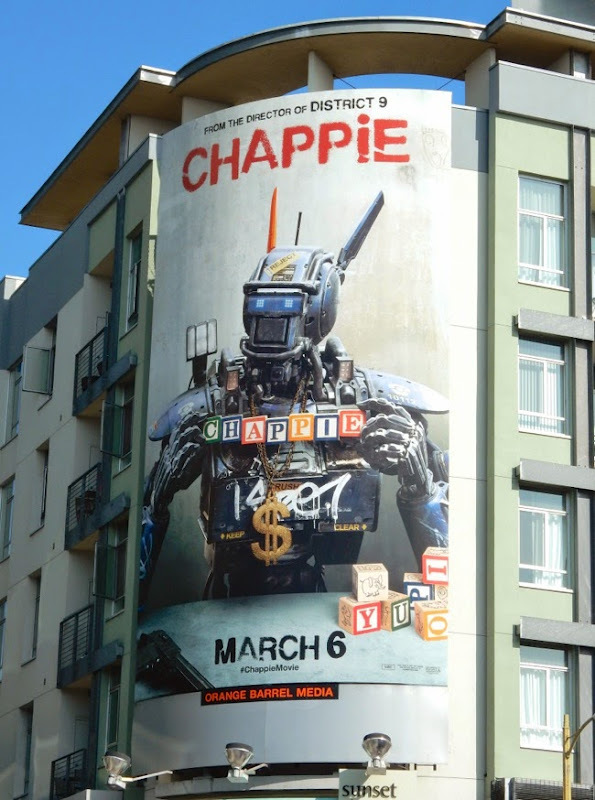 In recent years superheroes, vampires, fairytales and even Biblical retellings have been cannon fodder for Hollywood to plunder for inspiration, but from the looks of things 2015 may be the year of A.I. 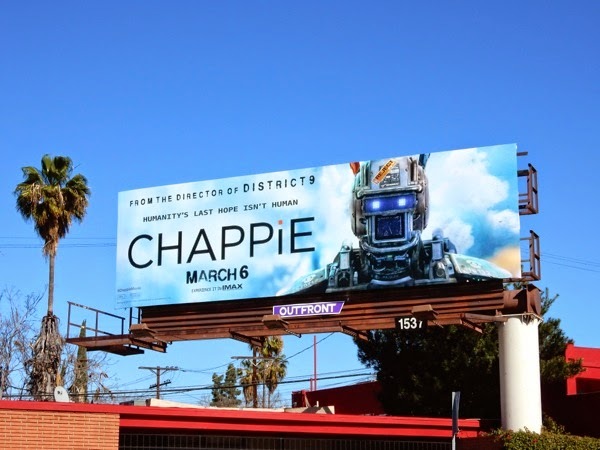 (Artificial Intelligence). 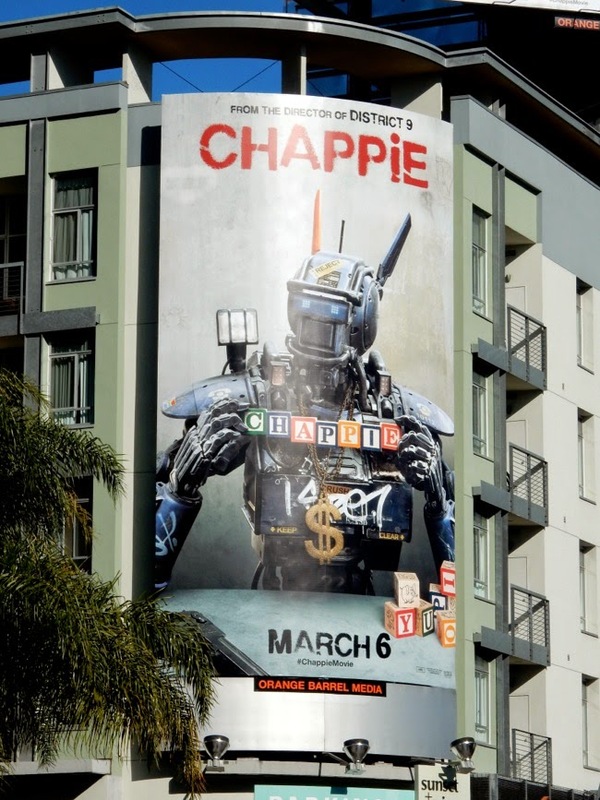 Whilst first time director Alex Garland brings us Ex Machina later this Spring, Earth's Mightiest Heroes unite once more to go up against an evil artificial intelligence in Avengers: Age of Ultron and even Skynet gets rebooted in Terminator Genisys, first off the assembly line is Neill Blomkamp's lovable robot, 'Chappie'. 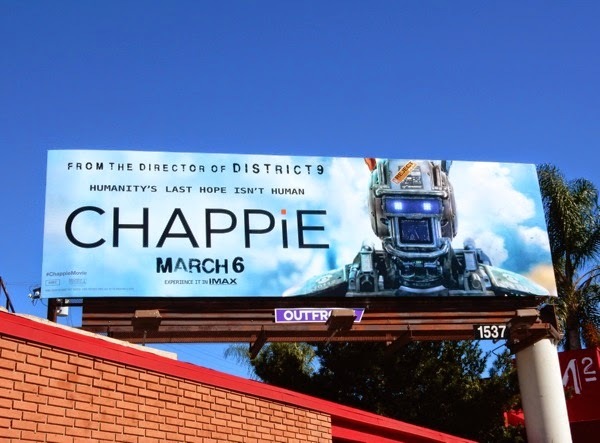 Regular collaborator Sharlto Copley provides the motion-capture performance for the titular robot, which represents a new kind of artificial intelligence that can think and feel and learns from its surroundings with childlike enthusiasm. 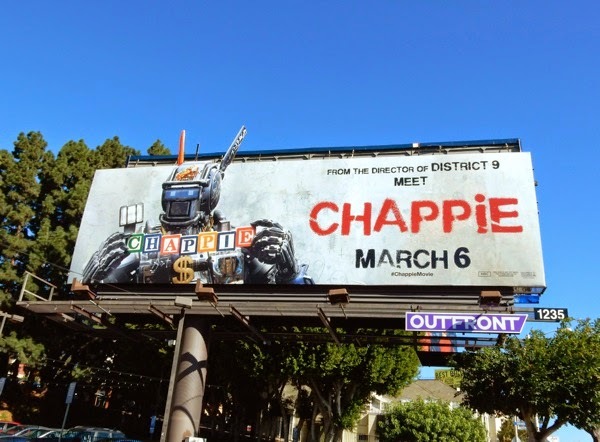 When Chappie is stolen by criminals and finds himself as part of a new family, including a father figure in the form of Dev Patel, questions are raised about this new form of technology, especially by Hugh Jackman's A.I. hating character. People always fear what they don't understand. 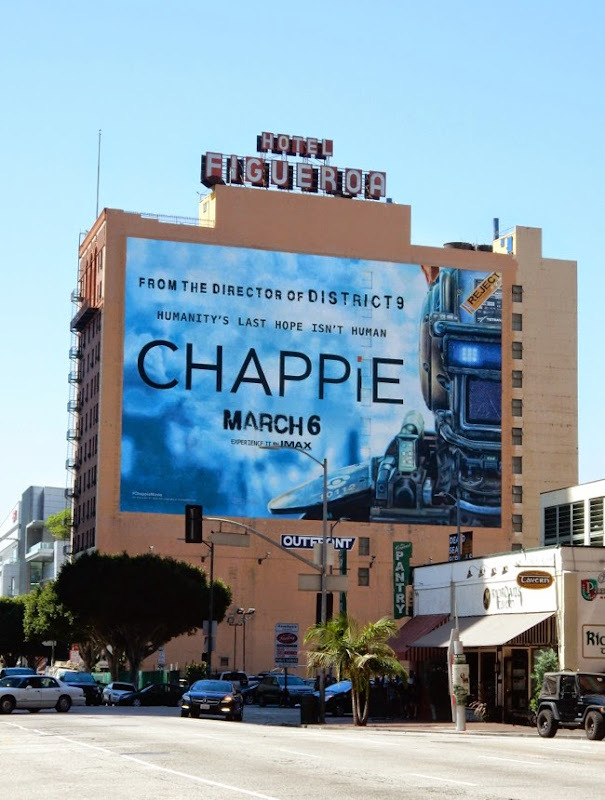 These billboards for the new science fiction film were snapped along the Sunset Strip, Highland Avenue and above Sunset & Vine in Hollywood on January 23, 2015. 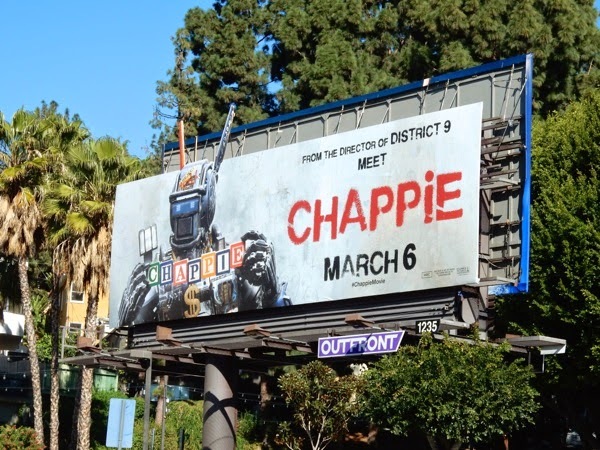 It's such a shame that the effect of the special extension version along Sunset Boulevard is spoiled by the taller billboard on the reverse (hopefully that's something which isn't an ongoing thing). 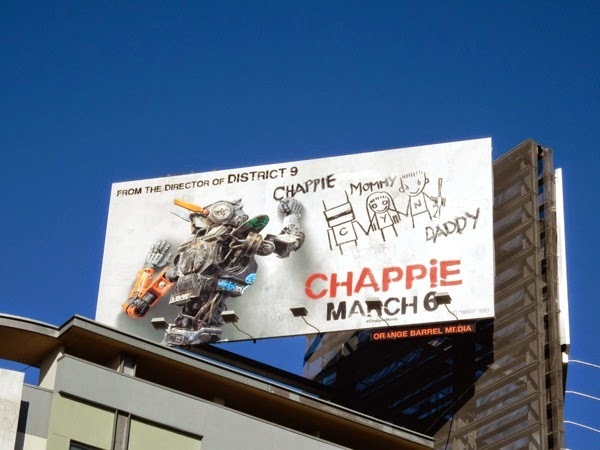 If you're a fan of the director, be sure to also check out these District 9 film billboards from 2009 and these Elysium movie billboards from 2013. 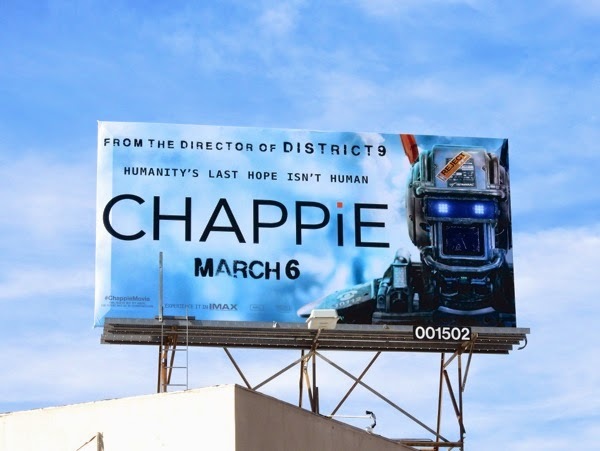 Hopefully Blomkamp has learned from past mistakes (Elysium really was a disappointment after the phenomenally original District 9) and Chappie truly will be the next step in the evolution of his filmmaking. 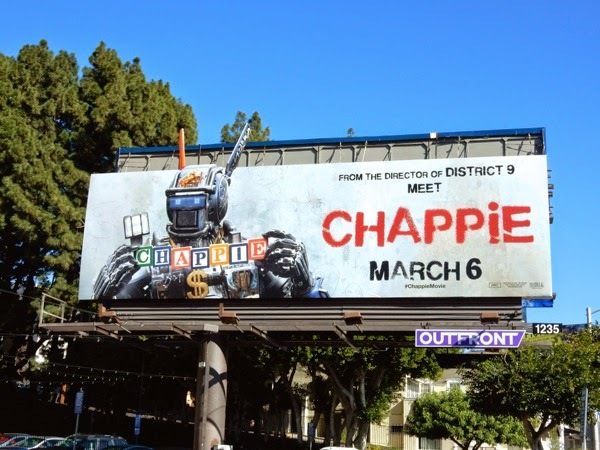 Are you ready to meet Chappie? 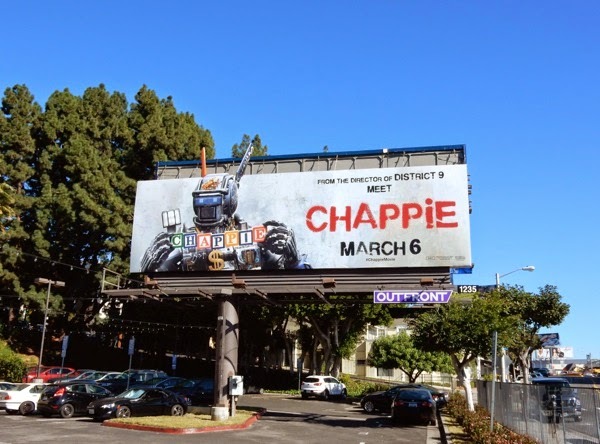 UPDATED: It looks like Sony is unleashing a second wave of billboard creatives focusing on the robot's face to help promote Chappie. 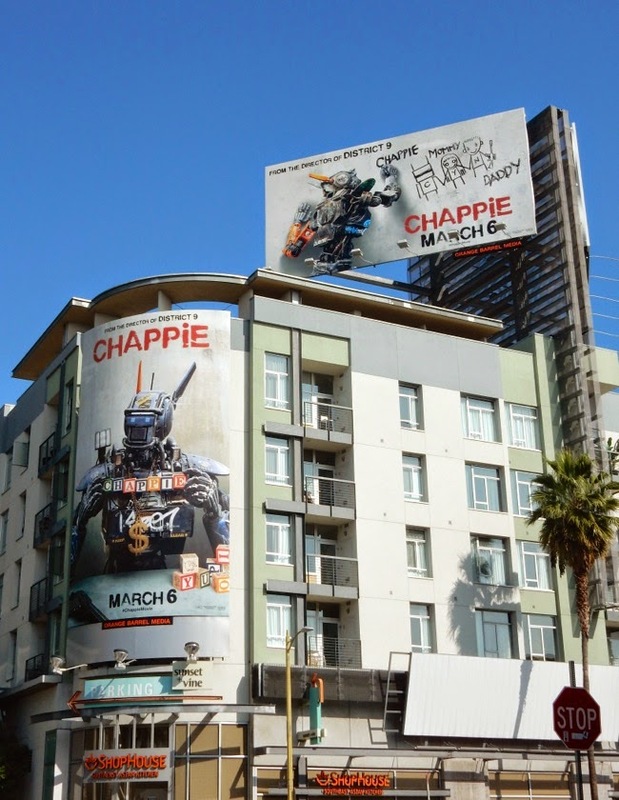 This standard landscape billboard was snapped along Melrose Avenue on February 12, 2015, whilst the smaller version was spotted along Sunset Boulevard the day before. 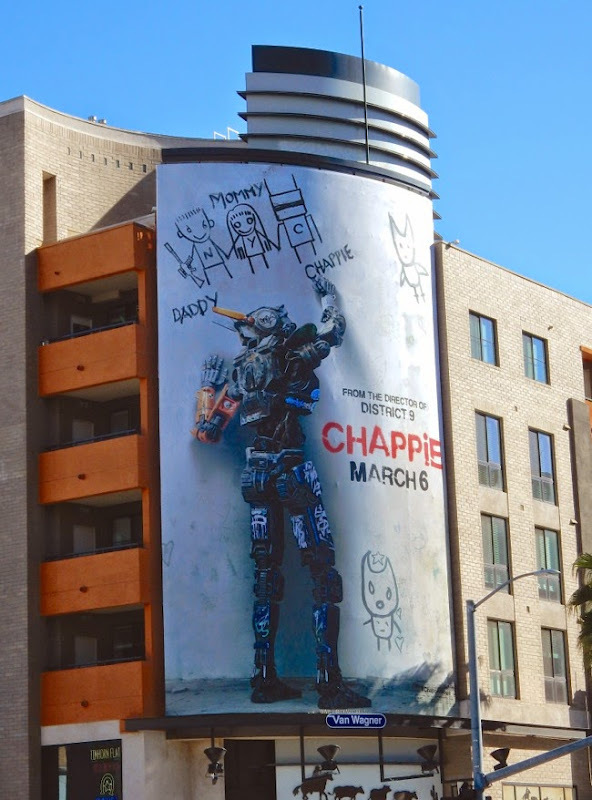 UPDATED: Here's also a giant-sized version of this second wave Chappie ad creative spied in Downtown L.A. on the side of the Figueroa Hotel on April 4, 2015.